September 23, 2002, L. G. Crabo. 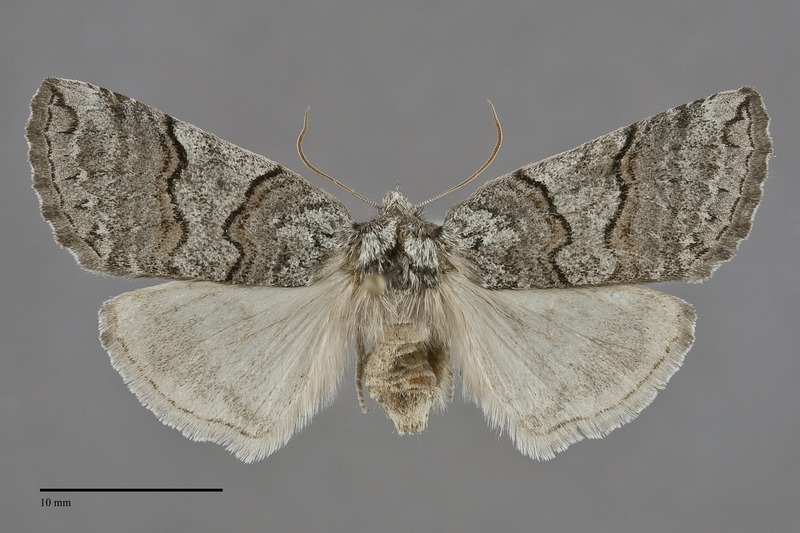 Ceranemota tearlei is a medium-sized moth (FW length 16–20 mm) with steel-gray wings marked with double black and brown transverse lines that flies predominantly east of the Cascades during the fall. The apical forewing is nearly square and the outer margin is convex and weakly scalloped. The ground color is steel gray, lightest and nearly uniform in the median area and darker and more mottled elsewhere. The apex is also lighter gray, bordered laterally by a thick black segment of the anterior subterminal line. A short black basal dash is present, thickest at the lateral end. The basal line is gray, inconspicuous. The undulating antemedial and postmedial lines are prominent, with the parallel components that are black abutting the median area and wood brown outside the median area. An "extra" diffuse dark gray line is oriented across the subterminal area in most specimens. The scalloped subterminal line is mostly light gray, with a blacksegment near the apex anterior to vein M1. The terminal line is nearly black. The fringe is gray with a tan base and weak darker scalloping in some specimens. The orbicular spot is a dark gray or black spot, while the reniform spot is absent or a barely perceptible gray smudge. 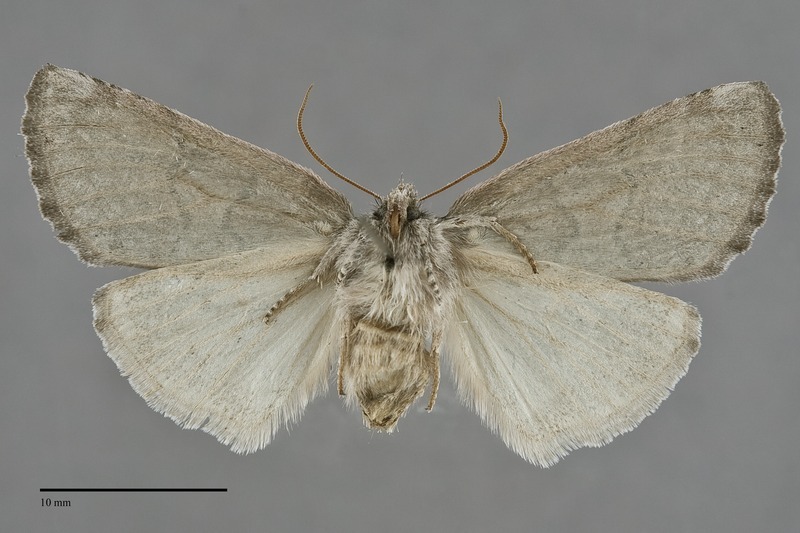 The hindwing is lighter gray with barely darker markings. The collar and central thorax are wood brown, while the rest of the thorax is gray like the wings. The borders of the tegulae are raised, causing a sculpted appearance to the thorax. The male antenna is biserrate. 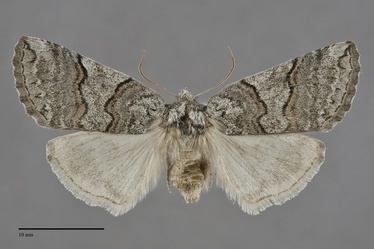 Ceranemota tearlei can be recognized as a member of the genus by its fall flight period, the shiny gray color, black and brown antemedial and postmedial lines, and the reduced spots. It is closely similar to Ceranemota fasciata and Ceranemota improvisa. The ground color of C. tearlei lacks a green tint found in both other species —best appreciated with specimens side by side—and its antemedial line is less undulating than in either of these species. In addition, the brown color of the collar and forewing lines in C. tearlei is less red than in C. fasciata and the forewing lacks contrasting darker areas found in C. improvisa. We see no difference between populations previously referred to as Ceranemota albertae and Ceranemota tearlei and therefore consider Ceranemota albertae Clarke to be a synonym of Gluphisia tearlei Henry Edwards. This species is common and widely distributed in forest habitats of the Cascades and Rocky Mountain regions, including higher elevation spruce-fir and mixed hardwood-conifer forests, lower elevation ponderosa pine forests, and quaking aspen forests. East of the Cascades, it also occurs in moist riparian zones along creeks and rivers in the low elevation desert zone. Ceranemota tearlei is mainly found east of the Cascade crest north to west-central British Columbia and the Peace River region. The range extends east to western Montana and the southeastern corner of Idaho. It is limited to southwestern Oregon west of the Cascade Range. This distribution is spotty in the southern part of the Pacific Northwest where it is limited to the mountains. This species occurs in western North America. The range extends from British Columbia and central Alberta south to central California in the west and to Utah and Colorado in the Rocky Mountains. This species is known to feed on various Rosaceae including serviceberry (Amelanchier alnifolia) and mountain ash (Sorbus scopulina), but it may also use willows (Salix spp.) in the Salicaceae within riparian habitats. Adults are single brooded and fly in the fall from late August through October. Most records are from September. They are nocturnal and come to light and bait. This species has no economic importance.